The significance and importance of sibling relationships for a child should feature in contact planning. This page contains practical guides for practitioners involved in planning contact between siblings and also resources for those involved in initiating and supporting contact. What do we know about the sibling networks of adopted children? Sibling networks of adopted children can be large, complex and fragmented. Children and young people can dispersed over different households (including living with birth parents or independently, or residing in other adoptive families, kinship, foster or residential care). Adopted children who are the youngest in their family are likely to have subsequent siblings born to either or both of their parents after they are adopted. Loss of sibling relationship as a consequence of adoption is widespread. The majority of adopted children (who have siblings) lose touch with at least some of their brothers and sisters. Paternal half siblings are particularly likely to be ‘lost’ to the adopted child. Adopted children are most likely to stay in touch with siblings who are also adopted or who are in long term foster care. Where siblings remain in the birth family, direct sibling contact is often lost because no direct contact with the adult birth relatives is planned. 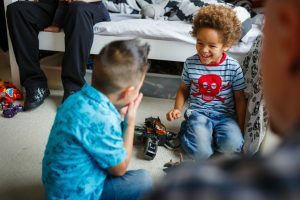 Children often have strong feelings about who they want to stay in touch with and who is ‘family’ – that may include people they are not biologically related to, for example step siblings or foster siblings. Why is sibling contact important? Adopted children and children in care generally want contact with their separated siblings. They often want to see more of their siblings, and may worry about separated siblings, including those they have never met. Older birth siblings, particularly those who have helped look after their younger brother/s and sister/s, may experience strong feelings of loss and anxiety when younger siblings are adopted. Relationships with siblings may have provided comfort and support for children when home circumstances were difficult. Maintaining these relationships can provide a source of continuity for adopted children and help to mitigate some of the loss experienced. Even when a child is separated from siblings, sibling contact can help provide links to a child’s birth family. It can provide children with a sense of belonging and a shared history, a chance to identify biological connection and likeness. Siblings can continue to be a source of support in adult life. Children and young people who are not able to see siblings may be very unhappy about this. Some may seek to reconnect using social media. This could expose them to dangers of unsolicited communication from others in the birth family, including with those they do not want contact. How does sibling contact work out? There are generally high levels of satisfaction with face-to-face sibling contact; contact with siblings is seen by children and adopters as less complicated and more positive than contact with birth parents. When siblings are placed in other adoptive families or long term foster care, shared interests and concerns can sometimes lead to strong bonds between parents/carers and mutual support for each other. How well the two (or more) sets of adults get on is crucial to how the sibling contact progresses. It is also important that the two (or more) more families (adults and children) have similar wishes and feelings about the nature and goals of contact. Meetings between brothers and sisters may not always be wanted by children or be practical or appropriate. But successful contact may happen using a multitude of forms of communication including cards, phone calls, videos, skype and email – instead of or in addition to visits. Simply having regular news about family members can be very important to children and adoptive parents. Some forms of sibling contact can be problematic or negative when pre-existing problems in the sibling relationships are not addressed. Sibling groups subject to very poor parenting may have learnt to respond negatively to each other and/or may try to control each or blame one another for their separation. In extreme cases, children may be subjected to physical, sexual or emotional abuse by siblings during contact. Sometimes sibling contact may bring feelings of sadness and loss to the surface, as visits involve parting from siblings again. This can provide opportunities for this loss to be acknowledged and for children to be comforted by their adoptive parents. Siblings may pass on information from or about birth parents during contact. This exchange of information may be helpful (for example an older sibling reassuring a younger sibling that adoption was the right decision, or passing on valued news about other family members). Sibling conversations can also create tensions or pose risks (for example a sibling telling a birth parent where the adopted child lives). Siblings may have very different views about birth parents or the adoption. This can be difficult for some children to manage, but sometimes these different views can provide a good opportunity for adoptive parents to talk to their child about their family situation. Arranging contact between larger siblings groups often poses practical challenges in terms of the need to contact multiple families, and finding a suitable date, location and activity that will work for all. Meetings may also be complicated by the varying ages and needs of the siblings and their differing views of the birth parents/family background. With evidence that in most cases sibling contact is wanted by children and can be rewarding and beneficial, it should generally be considered, promoted and supported (at least with key siblings) unless there is good reason for it not to occur. Try and map out and document who and where each child’s siblings are. Even if a child can’t stay in touch with all their siblings, they are likely to value this information about them. Who the child views as a sibling, bearing in mind that children do always not class ‘family’ just in terms of ‘blood’. The wishes and feeling of children about each of their sibling relationships. The dynamics of the relationship between siblings, including where siblings may need help to repair or improve their relationships in order to make contact successful. The ability and willingness of parents/carers to promote positive sibling contact. Planning will need to consider any risks associated with contact, such as emotional or sexual abuse by siblings. Contact with a sibling should not be automatically ruled out just because the sibling either lives with a birth family member or is in touch themselves with birth parents. A realistic appraisal needs to be made as to whether this does actually pose serious risks to the adopted child. Think about the goals of contact when deciding on how much and what type of contact. If contact is wanted in order to enable siblings to build or sustain their relationship, face-to-face contact is likely to be more appropriate than indirect contact. Siblings who meet up just once a year are unlikely to feel they can build a meaningful connection or keep a close relationship going. Where siblings do not have an established relationship and there is no plan to build this, the goal of contact may relate more to the children’s identity needs. Lower frequency meetings or indirect forms of contact such as letters, phone calls, or exchanges on social media may be appropriate in the short term. In the longer term children may wish to develop their relationship by meeting with each other. Meeting family members that are unknown or have not been seen for some time could be awkward and planning should ensure contact is introduced gradually, with suitable preparation. Normalising contact as a family day out as one may meet with extended family members can work for some, at venues with activities for a mixture of ages and personalities. In some cases interaction between siblings may need to be encouraged to help build relationships and ideal venues will facilitate communication (such as a theme park or zoo). In other cases spending time together in a manner which involves actual little direct interaction between children (such as a theatre show or the cinema) may be more appropriate for a period of time. It is important to stay focused on ensuring that the contact meets the children’s needs – whether this is continuing relationships, creating new relationships and long term links, slowly building familiarity and trust, or providing reassurance as to the sibling’s wellbeing. Face to face meetings may not always be wanted by children or be practical or appropriate for a period of time. Other ways of keeping in touch can be considered during planning. Successful contact has occurred using a multitude of forms of communication including cards, phone calls, videos, skype and email. Simply having regular news about family members can be very important to children and adoptive parents. Where there is a strong need for siblings to stay in touch with each other after adoption, this should be given high priority in the matching process. Prospective adopters may need help to think through the potential benefits of sibling contact. They may also need a safe space in which to air their worries about sibling contact and to talk through how these worries may be addressed. The parents and carers of siblings may also need similar help to think though the pros and cons of sibling contact. Where an adopted child is the only child in their birth family, it is still important to assess prospective adoptive parents views about sibling contact as it is possible that further children will be born to either or both of the birth parents. Preparation of adopters and carers of siblings is important. Many adopted parents struggle to see the value of contact over the long term. Carers of very young children particularly may need help to see the future value of maintaining links and building relationships, and understanding the importance of contact for the wider sibling group. For practical ideas and resources on how to include and explore ‘contact’ during training of prospective adopters see the Working with adopters page. What if sibling contact is not possible? If children can’t see particular siblings they often want to know the reason for this, and may feel an acute sense of loss or worry about them (for example wondering if they are being cared for and kept safe). They may need to be reassured with photos and videos or simply information about their siblings if meetings are not practical, unsafe or not wanted. It can be difficult if one sibling wants to see another who does not want contact with them. Alternative methods of maintaining some connection could be considered in such cases (including through adult only meetings or other methods of communication). It is important to respond to young people’s needs, curiosity and worries about siblings. Young people prevented from seeing or not able to see siblings may make contact over social media exposing them to dangers of unsolicited communication from others in the birth family with whom they do not want contact. Contact ideally needs to be reviewed periodically and adapted to changing needs. Attention should be paid to changing dynamics and personalities as siblings mature into independence or into different spheres of life (including reunification with birth parents for example). Some less complex sibling contact situations may require little support (for example visits between two adoptive families who get on well). Relationships with siblings or extended family members can be less complex than that with birth parents and similar to that of ‘cousins’. When siblings are placed in other adoptive families or long term foster care it may be easy for adoptive parents to integrate them into their social/kinship network. A shared family form, with similar interests and concerns related to the care of their connected children can sometimes lead to strong bonds between carers and mutual support for each other. Sibling contact can positively evolve to become more frequent or natural and open, prompted by adoptive parents, with more frequent visits, sleepovers, and shared holidays. In such cases the most helpful approach may be to encourage parents/ relatives/ carers to develop their own ideas and solutions about how best to achieve the goals of contact. Parents and carers should be given information about where and how to seek support if they feel they need this at any stage. However many adopted families struggle to maintain contact with their child’s siblings. For some carers with other immediate pressures, it can be difficult to see the immediate value of putting effort into establishing contact. Help to set up and maintain sibling contact may be important. Along with busy family lives this leads to practical challenges with regard to meetings. Children with little in common can result in difficulties finding activities that will be enjoyed by all. A sibling group of individuals raised with different values can lead to fears of negative influence and management of potential risk. Overall there must be an understanding that one approach will not fit all, and adults may need to be supported to meet and discuss what works for them, and be encouraged to collaborate together and work flexibly for the benefit of the children. The support needs of siblings who remain in the birth family also need to be considered. Some may need help dealing with feelings of loss. Others may need support to gradually let go of feelings of responsibility for younger siblings. Reassuring older children that their younger adopted siblings are well looked after may be important, alongside acknowledging and valuing the experience of the older sibling in caring for their brother or sister. Aim for relaxed meetings in a natural setting that is child friendly and where there are activities of interest to the children. In some cases meetings in the adoptive or foster home may be the most natural and relaxed setting. Think carefully about venues and activities. In some cases interaction between siblings may need to be encouraged to help build relationships. Think about if and how the venue and activities might enable children to interact. It is important to stay focused on ensuring that the contact meets the children’s needs – whether this is continuing relationships, creating new relationships and long term links, slowly building familiarity and trust, or providing reassurance as to the sibling’s wellbeing. When thinking about contact venues it is important to recognise and be sensitive to the fact that there may be significant differences between families in their ability to fund trips to certain more expensive venues (for example theme parks). Some siblings may have not learnt to play positively together and carers may need encouragement to work through difficulties to reap longer term benefits. It may be important to encourage a positive attitude towards working through initial difficulties and help the carers involved to be flexible, empathic, and to collaborate together. Meetings between the adults only early on may help with this. Where there is history of abuse between siblings consider how children can be helped to feel safe during contact. This might include openly discussing rules and boundaries with children before the visit and being clear about how these will be maintained, and/or using a specialist setting to facilitate the meeting. It is neither reasonable nor realistic to expect children to keep secrets or not talk to each other. Adopters should be encouraged to create a climate of openness and honesty so they can talk through with their child any worries they have after talking with siblings. Adults talking openly with the children can help them make sense of issues and learn important general life lessons in maintaining privacy and keeping safe. Sometimes sibling contact may reveal children’s feelings of sadness and loss. However contact that is temporarily upsetting should not necessarily be stopped – contact can help with communication around adoption allowing a child’s difficult feelings and memories to be expressed and talked about, aiding their coping with grief. Meeting between siblings often pose fewer risks than meetings with parents and it is often not necessary for a worker to ‘supervise’ meetings. In some case however there may be a role for workers in facilitating contact for example but ensuring meetings start and end smoothly, encouraging positive relationship building, offering emotional support, managing practical issues etc. It is important to respond to young people’s needs, curiosity and worries about siblings, Young people prevented from seeing or not able to see siblings may make contact over social media exposing them to dangers of unsolicited communication from others in the birth family with whom they do to want contact. Contact ideally needs to be reviewed periodically and adapted to changing needs. Attention should be paid to changing dynamics and personalities as siblings mature into independence or into different spheres of life (including reunification with birth parents for example). New children joining families may also require a reconsideration of contact. Looked after siblings or care leavers of unsettled residence can be difficult to keep track of and social workers of children in care can change frequently, making communication difficult. It may help to have one key worker who can keep track of all the siblings and help ensure the different parties can contact each other (directly or indirectly) so contact can continue. If face to face contact needs to be paused or ended alternative methods of maintaining some connection could be considered in such cases (including through adult only meetings or other methods of communication). Sometimes poor communication, misunderstandings or simply lost contact details can lead to missed opportunities for a connection or a closer relationship to be developed and a review and brief social work input can move contact forward. Adult to adult meetings or mediation can be important if there are difficulties or disagreements that need to be worked through between carers. Often a simple opportunity to share feelings can make a considerable difference to contact satisfaction. http://www.standupforsiblings.co.uk/ A Scottish website aimed at improving policy and practice around siblings in foster and adoptive homes. Angel, BØ. 2014. Foster children’s sense of sibling belonging. SAGE Open 4:1 –10. Ashley, C. and Roth, D. 2015. What happens to siblings in the care system? Report for the Family Rights Group. Available at https://www.frg.org.uk/images/PDFS/siblings-in-care-final-report-january-2015.pdf (accessed 15th May 2018). Boyle, C. 2017. ‘What is the impact of birth family contact on children in adoption and long‐term foster care?’A systematic review. Child & Family Social Work, 22(S1), 22-33. Cossar, J. and Neil, E. 2013. Making sense of siblings: connections and severances in post-adoption contact. Child & Family Social Work 18: 67. Farr, R. H., Flood, M. E. and Grotevant, H. D. 2016. The role of siblings in adoption outcomes and experiences from adolescence to emerging adulthood. Journal of Family Psychology, 30(3), 386. Greenhow, S., Hackett, S., Jones, C., and Meins, E. 2016. The Maintenance of Traditional and Technological Forms of Post‐Adoption Contact. Child Abuse Review, 25(5), 373-385. Greenhow, S., Hackett, S., Jones, C., and Meins, E. 2017. Adoptive family experiences of post‐adoption contact in an Internet era. Child & Family Social Work, 22(S1), 44-52. Grotevant, H. D., Perry, Y. V., & McRoy, R. G. 2005. Openness in adoption: Outcomes for adolescents within their adoptive kinship networks. Psychological issues in adoption: Research and practice, 167-186. Hegar R. 2005. Sibling placement in foster care and adoption: an overview of international research. Children and Youth Services Review 27: 717–739. Herrick, M. A., and Piccus, W. 2005. Sibling connections: The importance of nurturing sibling bonds in the foster care system. Children and Youth Services Review, 27(7), 845-861. Jones, C., & Henderson, G. 2017. Supporting Sibling Relationships of Children in Permanent Fostering and Adoptive Families. (School of Social Work and Social Policy Research Briefing; No. 1). Glasgow: University of Strathclyde. Jones, C. 2016. Sibling relationships of children in foster care and adoption: A review of international research, Children & Society, 30(4), pp. 324-334. Jones, C., & Hackett, S. 2011. Redefining family relationships following adoption: adoptive parents’ perspectives on the changing nature of kinship between adoptees and birth relatives. British Journal of Social Work, 42(2), 283-299. Kosonen, M. 1996. Maintaining Sibling Relationships – Neglected Dimension in Child Care Practice. British Journal of Social Work, 26, pp.809-22. Logan, J. and Smith, C. 2005. Face-to-face contact post adoption: views from the triangles. British Journal of Social Work, 35 (1), 3–35. Lundström T, Sallnäs M. 2012. Sibling contact among Swedish children in foster and residential care— Out of home care in a family service system. Children and Youth Services Review 34: 396–402. Macaskill, C. 2002. Safe Contact? Children in Permanent Placement and Contact with Their Birth Relatives. Russell House Publishing, Dorset. McDowall, J. J. 2015. Sibling placement and contact in out-of-home care. Policy and Advocacy Unit, CREATE Foundation. Moyers, S., Farmer, E. & Lipscombe, J. 2006. Contact with family members and its impact on adolescents and their foster placements. British Journal of Social Work, 36 (4), 541– 559. Mullender, A. (Ed.). 1999. We are family: Sibling relationships in placement and beyond. British Agencies for Adoption and Fostering. Neil, E., Young and Hartley. 2018. A survey of adoptive families: Following up children adopted in the Yorkshire and Humberside region – contact plans and outcomes (Centre for Research on Children and Families Research Briefing). Norwich: University of East Anglia. O’Neill, D., Loughran, H., & McAuley, C. 2017. Diversity, Ambiguity and Fragility: The Experiences of Post-Adoption Sibling Relationships. The British Journal of Social Work. Wojciak, A.S., McWey, L.M. & Waid, J. 2018. Sibling relationships of youth in foster care: A predictor of resilience. Children and Youth Services Review, 84, pp.247-254.